Now that they're working on Dungeon Siege 3 for Square Enix, are there any other Square Enix series the company would like a stab at? 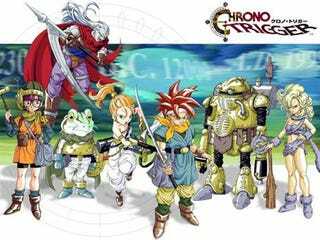 "Chrono Trigger," says CEO Feargus Urquhart. With their first attempt at an original role-playing game tanking, Obsidian Entertainment is free to focus on what they do best: Making sequels to other studios' RPGs. They've provided follow-ups to Neverwinter Nights and Star Wars: Knights of the Old Republic, and currently have Fallout: New Vegas and Dungeon Siege 3 in the works. What else would they like to sequalize? That's the question Spencer of Siliconera posed to Urquhart during a recent interview. His answer? "Chocobo Racing." His serious answer? "Chrono Trigger." "I think it would be fun to take the setting of a Japanese RPG, which is a weird mix of fantasy and sci-fi mashed together and make a Western RPG out of that...I think that would be cool. I mean it's kind of Star Wars, that's kind of what Star Wars is a fantasy in space. I think that would be interesting." Fantasy in space? That's doesn't come close to the feeling I got while playing Chrono Trigger or its sequel, Chrono Cross. Perhaps lead designer Nathan Chapman had a better answer? "I think we're going with Chrono Trigger because it has elements of a Western RPG. It's more open, it's still mostly linear, but there are parts you can explore more," said Chapman. "There are lots of differences, like you can beat Lavos at different parts of the game and you get different endings based on that. There are obvious answers like dialogue trees and all of that good stuff. The seeds are there for that kind of development." Okay, Chapman gets it. Do you hear that, Square Enix? We're okay with it, as long as Chapman is in charge. Make it so.